What Is The Best Balsamic Vinegar? 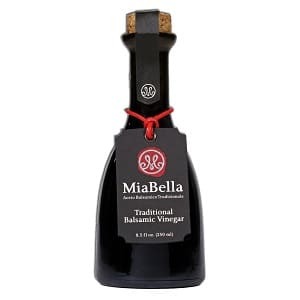 When looking for the best balsamic vinegar that offers the best balsamic vinegar flavor that is made in small, numbered batches, we picked MiaBella Balsamic Vinegar. This vinegar is aged for at least 18 years in oak and juniper barrels. Its Trebbiano grapes come directly from the lush hills of Modena. MiaBella does not add any sugars, caramels, flavors, or preservatives to their balsamic vinegar. The price of the MiaBella Balsamic vinegar stays within anyone’s budget while offering a certified authentic and unique balsamic vinegar. This is not your average balsamic vinegar that you find on your grocery store shelves. 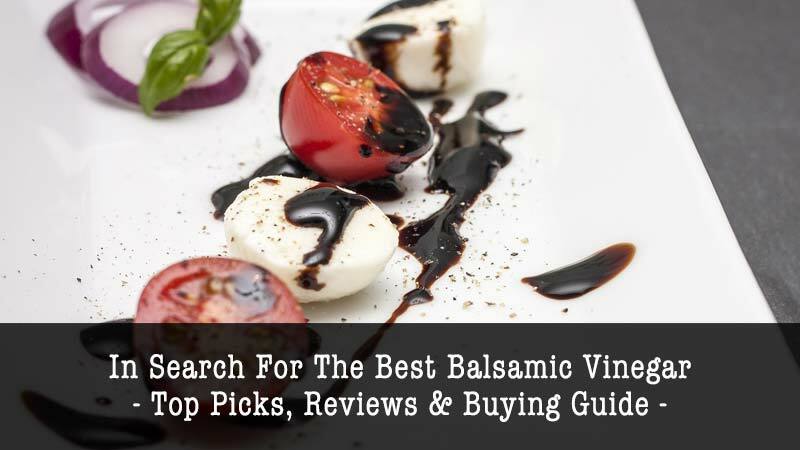 When looking for the best balsamic vinegar, there are some specific qualities that you should look for in your balsamic vinegar. If you are ordering it online, you will not be able to taste it, so you will have to be mindful of other aspects of balsamic vinegar. Balsamic vinegar has been around for centuries. There is an art of crafting the best balsamic vinegar you can find. It is aged in special barrels for years before being a high enough quality to share with the public. The best balsamic vinegars enhance any meal you are preparing, or any food you would like to eat. You should be able to pair your balsamic with meat, cheese, fish, vegetables, salad, and even desserts, like ice cream. You want a balsamic that will enhance, not overpower your food. There are different types of balsamic vinegar. Before you shop, you should know the difference between them and which you one prefer. You may have to try them all to find the right one for you. There is traditional balsamic vinegar, commercial grade and condiment grade balsamic vinegar. Within each grade, there are some variations. It is important that you know which of these grades you prefer so that you can find the balsamic vinegar that you will like best. When looking for an authentic balsamic vinegar, quality is important. You want to ensure your product is crafted with the highest quality grapes. You want to make sure that they are cared for properly and do not come into contact with chemicals or additives. You want to make sure that the process used to cook and age the grapes is also high quality. You want the best wood casks to be used to age the balsamic vinegar. Every step along the way matters. You do not want a step to be missed or put to the side because every one makes an impact on the taste and quality of the balsamic vinegar. Balsamic vinegar by nature is a product that is low in sugar, low in fat, and low in carbs. There is no real reason why anything needs to be added to an authentic balsamic vinegar. Look for one that does not have added color, caramel, or preservatives. Your balsamic vinegar should not have added sugar. A true balsamic vinegar can stand on its own without any additional flavorings, so there is no need to add anything else. Make sure the one you pick does not contain MSG. Be aware that some vinegars contain sulfites. If you are sensitive to them, or do not want them in your balsamic, be sure to read the label and make sure there are no sulfites in the one you select. You are going to add balsamic vinegar to your food. It will be in a sauce, a marinade, or a vinaigrette. You could choose to dip bread in it. You make pour it over top of a salad. Whatever you plan to do with it, it will involve food. You do not want a balsamic vinegar that adds too much of a tangy acidic taste to your food. Be sure you know what your balsamic vinegar tastes like before you pour it all over your food. If you are not used to an authentic balsamic vinegar, you should try a little bit of it to ensure that you are going to like it. It may not taste like the balsamic vinegar that you are used to buying on your grocery shelves. Price should always be a consideration in which product you choose. It does not have to be the only consideration, or that one that is the deciding factor for which one you purchase. A higher price tag does not mean better quality. Sometimes, it does and sometimes, it does not. You need to be aware of the price, but know that it may not be an indicator of taste. A higher price tag could indicate a higher quality. Just beware of the product you are buying. Even though balsamic vinegar has been around for centuries, within the past 20 years it has really hit its peak. Italians have been using balsamic vinegar for what seems like an eternity, but it is becoming more mainstream. As a result of the increased demand, imitations of authentic balsamic vinegar have cropped up. Those who know and enjoy the taste of real balsamic vinegar know what is real and what is an imposter. For those not as familiar with the taste of the real deal, they may be a little easier to fool. There are some things to note about real balsamic vinegar. One of the key things you should do is read the label and make sure you understand what it is telling you. The words on the label make all the difference. To start, there are three major grades of balsamic vinegar. There is traditional balsamic vinegar, commercial grade balsamic vinegar, and condiment grade balsamic vinegar. Within each of the grades, there are several different varieties. This means that the balsamic vinegar are crafted in the Modena or Reggio Emilia regions in Italy. Traditional balsamic vinegar is the highest possible grade and comes with a large price tag. These balsamic vinegars take many years to produce. This vinegar is often thick, glossy, and full of flavor. Lambrusco or Trebbiano grapes are the only ones that can be used in a traditional balsamic vinegar. The juice from these grapes are aged anywhere from 12 to 18 years in barrels made of wood. This vinegar has a unique and distinct flavor. Commercial Grade Balsamic Vinegar are the types of balsamic vinegars that are massed produced and allowed to age for the smallest amount of time possible. This type of balsamic vinegar is made from wine vinegar and typically has a caramel color. Thickeners and flavorings are often added to this type of balsamic vinegar. These vinegars are also labeled with specific words. They are labeled as “Balsamic Vinegar of Modena”, but only if they are crafted in the region of Modena. If the balsamic vinegar is made in the US, it will not have the Modena name on it. This vinegars are the ones that most people are used to and are commonly found on the grocery store shelves. These vinegars have a unique flavor that is both sweet and sour. 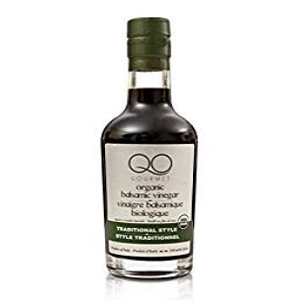 This type of balsamic vinegar is perfect to be used in salad dressings, sauces, and marinades. To be classified as a traditional balsamic vinegar, the vinegar must adhere to the most strict guidelines and requirements. Condiment grade balsamic vinegar have taken more time and paid more attention to those crafted as commercial grade. This tends to happen when a vinegar was produced with the traditional guidelines and crafted within the appropriate regions in Italy, but the vinegar was not aged for at least 12 years. These types of balsamic vinegars offer similar qualities and flavor to the traditional balsamic vinegars, but do not cost as much. Balsamic vinegar needs to be stored carefully. It needs to be cared for. It should not be put in the refrigerator. For the optimum flavor, it should be stored at 40 degrees to 85 degree Fahrenheit. It needs to be kept in a closed container at room temperature. It can be stored forever this way. Be aware that storing balsamic vinegar for a long time may darken the color of the balsamic vinegar and you may see some solids in the vinegar. This is a normal reaction and it does not mean that the vinegar has gone bad. Balsamic vinegar began in the Modena and Reggio Emilia regions of Italy. When it was first crafted, it was only for the upper class, the richest of Italy. It is made from expensive grapes that are cooked and aged in wooden barrels. The cooked grapes, or grape must, ages for at least 12 years in the barrels. Some age for as long as 25 years. It is then marked with the label “tradizionale” or “DOC”, so the purchaser knows that it is the best quality balsamic vinegar. There is nothing added to this vinegar. There are additional no sugars or colors. In more recent times, a non “DOC” version has been crafted. It is incredibly popular and purchased across the world. 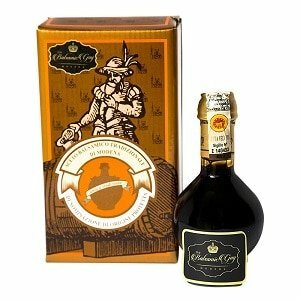 This is a commercial version of balsamic vinegar and it is labeled with “aceto balsamico di Modena” or “balsamic vinegar of Modena”. For it to have this label, it still must be crafted in the Modena region. It typically does not age for 12 years. It is made from grape juice and not grape must, a strong vinegar, caramel and sugar. The sugar and grape juice add sweetness and hide the high acidity of the vinegar. It is deep brown in color and has a fruity, sweet flavor. It is often used as a dressing, seasoning, or to deglaze. Red wine vinegar began in France. It is typically found in Cyprus, Europe, and Israel. It has a low acidity level. It is crafted from red wine. The red wine is fermented until acetic acid forms. This can take anywhere from one to two years. The vinegar is a better quality the longer it ferments. It is often said that red wine vinegar was created by accident. It happened when red wine was left open. The air came in contact with it and turned it sour. Red wine vinegar is a red to slight brown color. It has a mellow flavor. It will vary in price and gets really expensive based on the quality of the wine that is used to make it. It is often used for sauces and salad dressings. White vinegar is very different from any other vinegar and must be used carefully. It has a potent and unique smell. Any standard white is a solution of acetic acid and water. The most common ones have about four to seven percent acid. However, there are some that have as much as 20 percent acetic acid. The ones with the higher acid content are only used for cleaning and should not be consumed at all. White vinegar has been fermented from foods like potatoes, beets, molasses, and whey from milk. It would usually depend on whatever items were available in the area where the vinegar was being fermented. Today, it is commonly fermented from grain alcohol, or ethanol. Since this type of alcohol does not contain any type of nutrients that will start the fermentation of bacteria, additional ingredients, like yeast or phosphates must be added to start the process. Not only does white vinegar have a potent scent, it also has a much harsher flavor than balsamic or red wine vinegar. Most people does not drink white vinegar start, but it is incredibly useful when used in recipes. Some things white vinegar is often used for is pickling food. When combined with pickling spice and water, white vinegar is the base for pickled eggs, vegetables, and fruit. And do not forget dying eggs. White vinegar has been used as a component to dye eggs for years. It is used in salads. It can help enhance the flavor of many salads. However, use only a splash because a little white vinegar goes a long way and too much of it will ruin your salad. Start with a tiny amount and taste, then add more as you would like. It is used in sauces and marinades. It adds a little bit of zest to the sauce but can also tenderize meat, vegetables, or seafood. White vinegar can be used in baking. When combined with baking soda, it is a leavening agent for baked products. The acid in the vinegar has a reaction with the alkaline in the baking soda, which releases carbon dioxide and magic happens. Then whatever you are baking rises. White vinegar is used to make cheese. Some cheeses are made by combining milk and vinegar. When vinegar is added to milk, the acid in the vinegar interacts with the protein in the milk, which causes the curd and whey of the milk to separate. It then creates a soft and mild cheese. White vinegar is not just used in the kitchen, but it also has many health benefits. It has been used for centuries to help control blood sugar, especially when used after eating. It can help control weight gain. It is thought that drinking some vinegar will help you feel full and slow down the emptying of the stomach. This can help someone not overeat. It may reduce cholesterol and treat things such as nail fungus, warts and ear infections. It can also be used topically for infections on the skin and burns. One of the major things that vinegar can do is clean. White vinegar has antimicrobial properties and it is unbelievably useful as a disinfectant and cleaner for every household appliance and surface. It can also kill weeds in the garden and help cut flowers live and stay fresher longer. In summary, traditional balsamic vinegar is the most expensive and tart vinegar you can find. It is made from grapes and started in Italy. Red wine vinegar is made from red wine and started in France. It tends to be less expensive than balsamic vinegar, depending on the quality of the wine that is used. It is more mellow in flavor and is a reddish brown color. White vinegar is made from alcohol and has been created in many varying areas. White vinegar is much more potent and has a harsher taste and smell. They can all be used in food with different results. The most typically use for all of them is in a salad, or salad dressing. White vinegar should be used sparingly because it will quickly over power and ruin the taste, and smell of your food. They all have a different taste and bring something different to your food. It comes down to which one you like, or even which one you are currently in the mood to have. One of the unique properties of white vinegar is that it is a household cleaning and disinfecting agent. None of the other vinegars can be used to wipe down a counter top or clean the sink. To find the Best Balsamic Vinegar, we looked closely at the reviews and rating from consumers and experts. From all the brands we reviewed, these seven stood out to us for their quality, taste and price. Why You’ll Love This: MiaBella Balsamic Vinegar is made with 100 percent grape must and does not contain preservatives. MiaBella Balsamic Vinegar is a real balsamic vinegar that is made in small batches for a unique taste and flavor. All bottle are numbered and signed. This vinegar is aged for up to 18 years in barrels that are made of oak and juniper. It is made from 100 percent Trebbiano grape must that comes directly from the hills of Modena, Italy. MiaBella does not add any sugars, caramels, flavors, or preservatives. This vinegar is in its most natural state and flavor. It is a rich, deep, brown syrup that is perfectly balanced. This balsamic vinegar is so diverse it can be used on meat, cheese, fish, salads, strawberries, or even vanilla ice cream. MiaBella Foods is committed to providing the highest quality ingredients so that all customers receive the perfect gift. This centuries old recipe is now widely available to you any time you want to purchase it. This traditional balsamic vinegar is made from a reduction of cooked Trebbiano grape juice, known as grape must, and it tastes nothing like the balsamic vinegar you find on your grocery store shelves. It dates all the way back to the Middle ages and comes from the Northern regions of Italy. 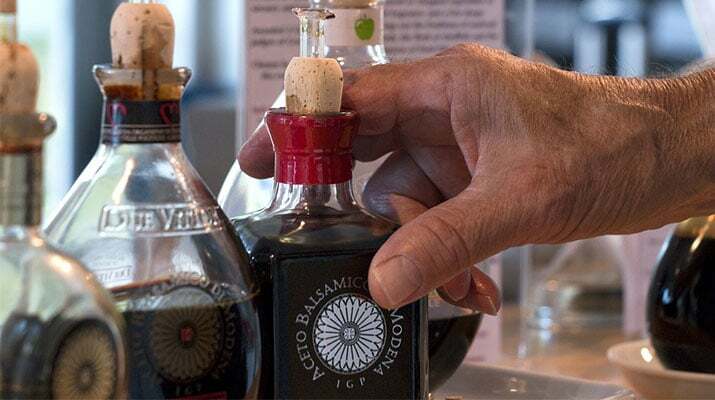 Why You’ll Love This: The Balsamic Guy’s Traditional Balsamic Vinegar of Modena is guaranteed by the Consortium of traditional balsamic vinegar producers in Modena, Italy. The Balsamic Guy’s traditional balsamic vinegar has real balsamic vinegar taste. It has been tasted by a panel of experts that have authorized its sale as true balsamic vinegar. It has held up to the highest standards for smell, taste and visual elements. Only then can it receive a numbered seal indicating that product is of the highest quality. This balsamic vinegar is made from cooked grapes and left to age for at least 25 years in a barrel made from wood. This guarantees that you are receiving authentic traditional balsamic vinegar. This is the oldest traditional balsamic vinegar, known more commonly as extra Vecchio. It is the perfect compliment to all kinds of food, such as cheese, fish, meat, vegetables, and even dessert. It is naturally low in calories and full of minerals and anti oxidants. The Balsamic Guy guarantees this will be the best balsamic vinegar you ever taste. If you are not completely satisfied, he will issue you a full refund. It is the perfect gift. It comes in a gift box with its exclusive bottle, pourer, and informational recipe book. Why You’ll Love This: Simple Girl Balsamic Vinaigrette is one you can feel good about using because it is organic and free of preservatives. 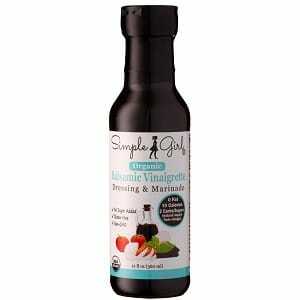 Simple Girl Organic Balsamic Vinaigrette is a completely guilt free way to add some flavor to your next salad. This is a certified organic vinaigrette that includes 100 percent organic balsamic vinegar from Modena, organic spices and organic lemon juice. All ingredients are gluten free. This is a vinaigrette is a dressing that you can feel good about using, as it is perfect for all diets, including Keto and Weight Watchers. It has low sugar at only two grams per serving. It is naturally sweetened by the organic grape must and a trace amount, less than two percent, of organic stevia leaf extract. This healthy balsamic vinegar salad dressing in low in calories and carbs, with only 10 calories and two grams of carbs per serving. It does not contain any animal products so it is perfect for vegans and vegetarians. It does not contain preservatives or MSG. There is nothing artificial about this vinaigrette. It does not have artificial colors or sweeteners. It has a full natural flavor that is the perfect marinade for meat, fish, or tofu. Why You’ll Love This: Colavita White Balsamic Vinegar offers the uniqueness of traditional balsamic vinegar but with a fruity white wine taste. 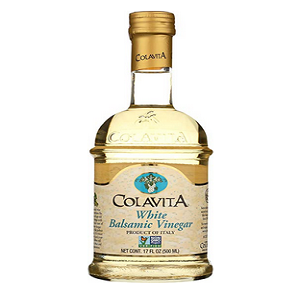 Colavita White Balsamic Vinegar is a product of Italy and brings to you all the complexity of a balsamic vinegar without color and with a fruitiness you will not find in other balsamic vinegars. Colavita is made with wine and has an acidity level of six percent. It does not contain GMOs. It is certified as a non GMO product and has a certificate number. It is excellent paired with white meats, vegetables, salads, fish, and rice. Is it a perfect addition to any white sauce. It is a perfect compliment to sautéed Brussels sprouts and parmesan cheese. This is an excellent vinegar for summer berries or mixed with extra virgin olive oil on a green salad. It can be added to any picnic salad like roasted corn and tomatoes with fresh mozzarella. There is no limit to all the foods you can add this white vinegar too. Why You’ll Love This: Ellora Farms Pure Balsamic Vinegar is from Crete, Greece and it is 100 percent natural. Ellora Farms is aged for six months in a barrel made of oak and creates a sweet and sour flavor. This is a 100 percent natural product that does not have any added colors or sweeteners. 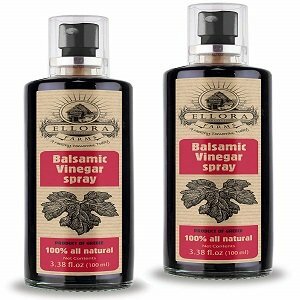 The balsamic vinegar comes in a spray that allows you to control your portions. This spray bottle is scientifically designed for this type of oil so it won’t clog. This comes straight from the vineyards in Crete, Greece. It is made with 100 percent grape must and it is a 100 percent natural product. There are no colors, caramel, sulfites, or preservatives. It pairs perfectly with salad, ice cream, mussels, fruit, vegetables, and various cheeses. There is no fat added to this balsamic vinegar, so this can be a part of a healthy diet. This is low calorie and can help with digestion and aid in weight loss. There are no animal products so those who are vegan and vegetarian can enjoy this balsamic vinegar. It has a low glycemic index and helps improve circulation and overall healthy skin. Why You’ll Love This: QO Organic Thick Aged Balsamic Vinegar is a thick silk Balsamic Vinegar from Modena. The QO Organic Thick Aged Balsamic Vinegar was produced and bottled in Modena, Italy. It is USDA organic certified. It is a thick and dense silky organic aged balsamic vinegar of Modena. It is full bodied and well balanced. It is refined in barrels made of wood. It has an acidity of four percent. It does not have added sugar or caramel. It does not have added colors, thickening agents, or preservatives. It come infused with three flavors, citrus, hot chili, or raspberry. It is made in small batches and comes in a beautiful glass bottle. It can be paired with all kinds of foods including meat, ice cream, cheese, fruit, and salads. It can be used in marinades. The balsamic vinegar should be kept away from direct heat, sunlight and should not be stored in the refrigerator. Why You’ll Love This: The Guiseppe Giusti Italian Balsamic Wine Vinegar is crafted from the old favorite recipe of Riccardo Giusti. 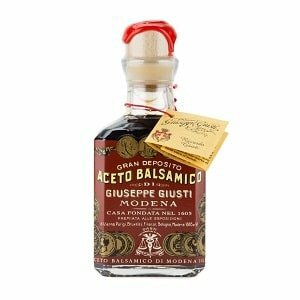 The Guiseppe Giusti Gran Deposito Balsamic Vinegar is a gourmet balsamic that is a deep color of brown with a velvety smooth texture. It is an aromatic blend that has notes of jam, fruit, honey and vanilla. It pairs well with pasta, beef, cheese, and fruit. It is made from a grape must that comes from sun dried grapes and aged vinegar. It is aged in barrels and perfected with age. Traditional balsamic comes from the regions of Modena or Reggio Emilia and it is produced from Lambrusco or Trebbiano grapes. The balsamic wine vinegar is aged in barrels that are special and have been in the Gusti family for decades. The barrels of crafted from various woods for all the steps in the process. The vinegar takes on the flavors of the casks. After at least 12 years, the vinegar is ready. Once it reached the highest standards is the vinegar ready to be bottle and sealed. The Guiseppe Giusti company was founded in 1605 and is the oldest producer of vinegar in the world. They are constantly changing to adapt to changes to technology and aim to make the environment a sustainable place. Balsamic Vinegar is beneficial to your health. It has been shown to lower cholesterol, help digestion, improves circulation, and can aid in weight loss. It can also help reduce high blood pressure and promotes healthy skin.